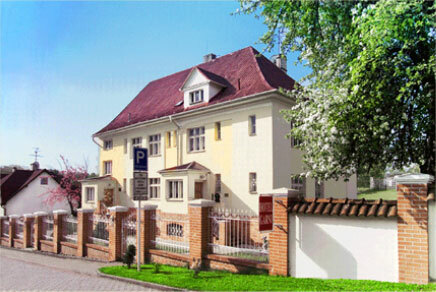 Garni Garni Hotel Ostrava stands for quality accommodation in town. Ostrava is Czech Republic's third largest city. Ostrava lies where the territories of three countries meet: Czech Republic, Poland and Slovakia. Ostrava is the right base for trips to Beskydy, the nearby mountains. The city itself stands for monuments of industrial history, architecture, musical and sports activities. Choose Garni Garni Hotel Ostrava and see the town; enjoy partying in Stodolní Street, the no. 1 bar and night life hub; visit Slezkoostravský Hrad, the medieval castle, now venue of culture events such as Colours of Ostrava, the annual world music festival; see the culture and show area of Černá louka; visit the Mining Museum, the ZOO; and climb to the top of the 73m city hall tower. Garni Hotel Ostrava is located in the Trinity Valley, a secluded, calm villa quarter just a 10-minute walk from the central Masaryk Square, a 5-minutes drive from the Zoo, the Ostrava University, the castle or Černá louka; a 10-minutes drive from ČEZ Arena; and a 15-minutes drive from the golf course at Šilheřovice. The Bazaly Football Stadium is just a comfortable 10-minutes walk away from Garni Hotel Ostrava. A 30-minutes car drive is all it takes to reach the Mošnov Airport. The recreation area of Beskydy is just 35 minutes away by car and the nearest Polish town is just 15 km from Garni Hotel Ostrava. It is a nice walk from Garni Hotel Ostrava to the Ema Hill, a 333 m high former colliery dump, now a revitalized green area full of wildlife and a lookout place to survey the panoramic views of Ostrava and around. The villa quarter was built by Earl Wilczek in the 1920s. Our local area, including Garni Hotel Ostrava, was renovated at the turn of the century. The renovation of Garni Hotel Ostrava was completed in 2010. Garni hotel Ostrava offers single rooms, double rooms, three-bed rooms and apartments, all nicely furnished, with bath (large tubs) or shower, WC, TV-SAT, telephone and WiFi broadband (10 MB). Extra beds available on request. Garni Hotel Ostrava has its own parking lot safely fenced off and locked overnight. Garni Hotel Ostrava owns a large garden including a camp fire site and lava grill. Garni Hotel Ostrava offers a special accommodation for special occasions: a romantic apartment for the newly weds or for your own special moments. Choose the hunting lodge-style rooms with open fireplace to meet friends or business partners at Garni Hotel Ostrava. Hotel Garni Ostrava is looking forward to see you!